Need a vacation? Is Hawaii calling you? Our 2-bedroom Mana Kai condo is fully equipped with everything you need and is great for families. It has a full kitchen and an open living room with sliding glass doors that lead to a spacious lanai overlooking the beach. 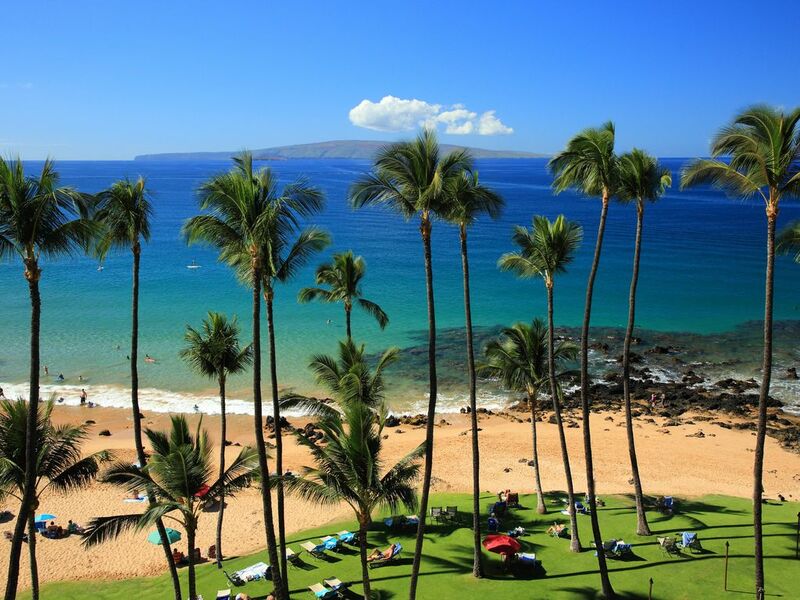 Mana Kai Maui is an eight-story resort situated right on a beautiful white-sand cove of the Keawakapu Beach, one of the best and also most kids-friendly beaches on Maui. Our condo is on the 7th floor with unobstructed views of the ocean and outer islands. One of the best snorkeling reefs is just steps away, and you are within minutes from upscale shopping and restaurants in Wailea or more affordable, surfer-spirited Kihei. Golf courses and tennis courts are nearby. We love this place and hope you’ll like it too! Why Mana Kai: In 1998, we stayed for the first time at the Mana Kai Maui with out 6-months old son. It was love at the first sight: we've been back every year! After 6-7 visits, we decided to buy the condo. It is our happy place - everyone in the family loves it there! It's so beautiful, peaceful, and convenient too. The Mana Kai is right on the beach - we fall asleep to the sound of the waves and wake up to the songs of birds; we watch whales from the lanai and go snorkeling without driving anywhere; we love to stroll along the seemingly endless, most beautiful and uncrowded beaches of the South Shore. We hope your experience will be just as wonderful! Essence of Aloha: Over the years, Mana Kai produced thousands of happy and loyal visitors - just search for 'Mana Kai' to read their stories! But no words can describe the beauty and aloha of this truly unique place - you have to experience it by yourself. We loved our time at the Mana Kai. It is a special gem. Our condo was perfect! A new addition at the Mana Kai is there is hula lessons on Wednesday mornings at 10am, and my family and I thought it was so fun! The teacher, Jordan, was patient and funny. It was a hoot and everyone should try it. Enjoy a very special place that my family has loved and created memories. The view out of the balcony is perfect. Ocean, whales, sweet smell, birds singing. Happy place. Basic 2 bedroom condo. Mix & match artwork, furniture ok, and clean when we arrived. We had a wonderful time at Mana Kai. Amazing Location and Incredible views! We stayed at the beginning of January for 9 days in Igor’s condo and it was incredible. The view is amazing, the location is perfect, and with a little one it could not have been more convenient. The back room has black out curtains and A/C and was perfect for napping and sleeping our little one. The front bedroom overlooks the beach and the ocean and even without AC with the patio door open (there is a screen) and fans on and nights were cool and we were very comfortable. The condo has everything you need to prepare meals, although I did not realize the BBQs were communal and not on the lanai. Not a huge deal, just a note when you’re planning your meals. I saw some comments about the decor, it’s a Hawaiian condo and it decorated like a Hawaiian themed condo. The bathrooms and kitchen are updated and clean and the condo furniture is comfortable. What more can you want for the minimal amount of time you want to spend indoors. Even when you’re in the condo we spent more of our time on the lanai as it overlooks the beach and the ocean. Even at nap time we could sit outside directly in the sunlight and overlooking the ocean. For travelling with kids who still nap this condo was great for not feeling couped up inside during nap times. Keawakapu Beach was our favourite last time we were in Maui so it was great to be able stay right on it. We walked on the beach to the Wailea board walk and all down the walk a few mornings and it is a great way to start the day. The surf is on keapwakapu beach is fairly gentle so it was a great place for our toddler to be able to play and for us to take her in the water. The sunsets on Keawakapu are amazing and on several afternoons you could see whales jumping in the distance. While we did not do much snorkeling because we have a toddler, people were saying every day they saw turtles out in front of the resort which is amazing. Overall our stay was excellent, Igor and the property manager were very responsive with any questions we had, and we are already planning our next trip back! Stay here! You won’t regret it. Thank you, Tara, for a wonderful review! You highlighted exactly the points we value our property for! The best place to bond and spend quality time with your kids. Mana Kai association prohibits grilling on the lanai to provide enjoyment of outdoor sitting to all guests of the resort, but where else do you find a communal BBQ with a view like that! Clean, had some slight issues with freezer but addressed quickly by support staff. Owner very available. Would definitely return. We have stayed at this complex before and this particular unit is a nice one. My family had an absolutely wonderful time! We were a group of six, including two little kids and grandma who has limited mobility. The proximity to both the elevator and the beach was ideal for my mom, who had a broken foot. The back bedroom with the A/C unit was quiet, cool, and perfect for the kids. The view was SPECTACULAR from the living area and master bedroom. This was our third trip to Maui. The previous two times we stayed in Kaanapali at the Honua Kai. Though the room and grounds at Honua Kai are great, the view of the beach and the beach itself didn't even come close to comparing to the one at Mana Kai. In previous trips, we loaded up the car every day and went to different beaches. This time we spent all but one day at the beach at Mana Kai. The snorkeling was great (turtles!) and the waves and under current weren't too strong for our kids. We really preferred Kihei to Kaanapali as well. There was a more "local" feel, and we really enjoyed the food in the area. We are already planning our trip back! We wouldn't change a thing! Other Activities: Boating, shopping, kayaking.